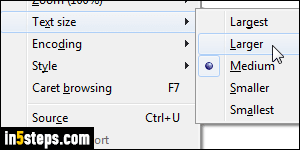 Several settings control the text displayed on web pages you view in Internet Explorer. 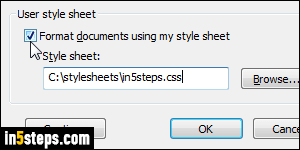 Most websites use "style sheets" (CSS) or "HTML formatting" to change the font family, text size, and colors of a page. But you can override that by setting your own font size, for example. If you want to make the entire web page look bigger (or smaller), consider using IE's zoom functionality instead. Your first option is to change the actual font size (which defaults to medium). This command, in IE 11/10/9 only shows under the classic menus (show IE's classic menus). 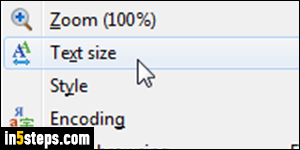 Just hit your keyboard's Alt key to show the menus, and go to View > Text Size > Largest / Large / Medium / Smaller / Smallest. Without getting too technical, the effect of this command only works when the designer used "relative font sizes". So, in many cases, it won't help but is worth trying! If the web page shows a strange font, where font family is the issue, not text size, click on the gear icon (top right corner) and choose "Internet options" from the menu. I'll stay in Options for the rest of this tutorial, going through text options, so don't close it between steps. 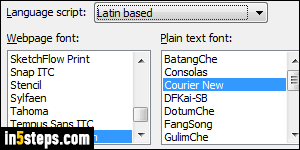 Click on the Fonts button: "Latin based" for language script works for English. Pick your default proportional and plain text fonts - when no font information is given by the web page. Back in IE's Options dialog, click on the "Accessibility" button at the bottom. 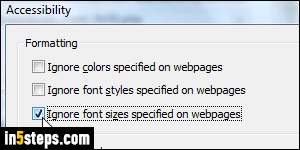 This gives you full control over text formatting in web pages: check the "Ignore font sizes specified on web pages" to make the one picked in step 2 work. Check the "Ignore font styles specified on web pages" to automatically apply the fonts you picked in step 3. "Ignore colors" will show text only in the colors you approve under "Colors" (leftmost button in Options dialog). If you know enough CSS, or are willing to learn its basics (it is very simple), you can check the "Format documents using my style sheet" checkbox, and supply your own style sheet to customize the font families, text sizes, and colors for links and other web page elements. The downside of all these settings is that you'll never see web pages the way its designer(s) intended to. But every site you visit will be easily legibly, using your favorite text styles!